After freshening up, we walked to Avenue of Stars from our hotel. It is like a 20-minute walk – passing by Sogo TST. The sea-front Avenue of Stars is like Hollywood’s Walk of Fame. The walkway is filled with handprints of Hong Kong’s superstars like Jackie Chan and Andy Lau. 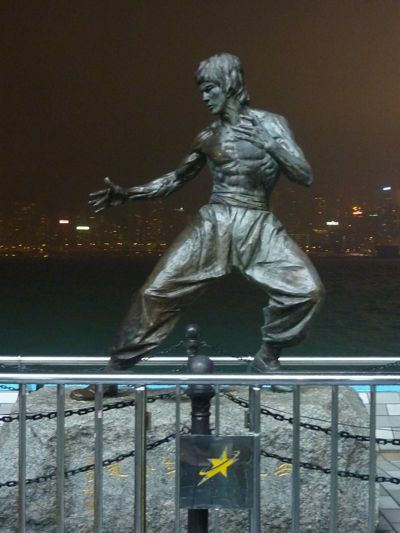 And not forgetting Chinese kung fu legend Bruce Lee. In fact there is a statue of him. From there, one can witness Symphony of Lights across the harbor. The show starts at 8pm sharp every night. From Tsim Sha Tsui, it is a display of lights beaming from high rise buildings on Hong Kong Island. To me, it was not as spectacular as what I had read. But it is worth going if you have not seen it before. In order not to miss Symphony of Lights, we postponed our dinner till after the show that night. We had our late dinner at Tsui Wah Restaurant on Carnarvon Road, Tsim Sha Tsui. 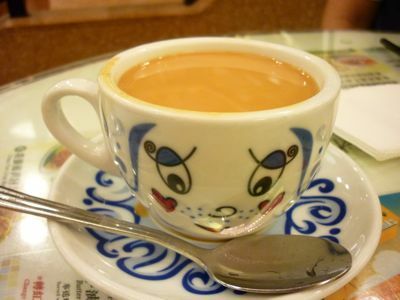 I had another cup of nai cha there before calling it a day.